This savory mushroom rice is a baked rice recipe. Just do a bit of prep work then pop it in the oven to let it bake. I love easy vegetable recipes like this one. Even though it takes a bit of time to bake, it just bakes away on it’s own, allowing you to do other things while it cooks. Bake a few seasoned chicken breasts in the oven at the same time and you have a very easy dinner recipe. Anything to make the cooks life easier is always a good thing in my books! 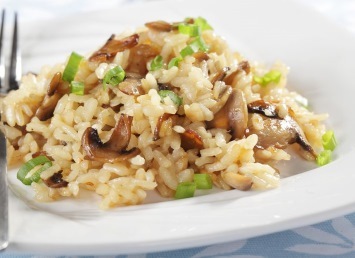 If you like mushrooms you will really like this rice recipe. The celery, onion and butter add richness and a wonderful savory flavor and the soy sauce adds just a little punch of extra flavor. This is a perfect side dish recipe for meat dishes like beef or chicken, but also makes a great main course in a vegetarian meal. I will often do that – make a yummy rice and vegetable dish and just serve it with other vegetables for a meatless meal any day of the week. In a skillet, saute the rice in butter until it is golden in color. Add the celery and onion; cook and stir for 2 minutes. Add the mushrooms, cook and stir until the celery is tender. Transfer to a greased 1 1/2 quart (1.5 L) baking dish. Stir in the broth, water, soy sauce, green onion and dried parsley. (See note below for using fresh parsley). 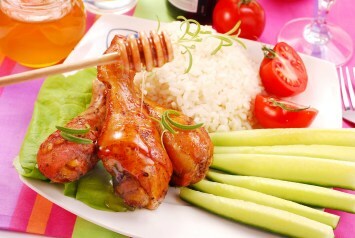 Cover and bake in a preheated 350ºF (180ºC) oven for 45 to 50 minutes or until the liquid is absorbed and the rice is tender. I would serve this rice with steamed green beans – or liven up the plate a bit with colorful carrots. If you are using fresh parsley in this recipe, and fresh is always nicer if you have it, bake the rice without the parsley. Stir in the fresh parsley once it is baked, or sprinkle it over the rice before serving it. Note that the green onion is optional. It looks beautiful in the baked rice and adds a bit of flavor, but you also have onion flavor from the white onion in the recipe, so if you don’t have it just leave it out. Make sure the chicken or vegetable broth is at room temperature. If it’s cold from the fridge, it will take longer for the rice to fully cook in the oven. Browse more delicious rice recipes on the site here. Here’s an idea. Serve this yummy baked rice with bean burritos for a fantastic vegetarian meal.